In Short: A collection of short stories from different parts of his career. 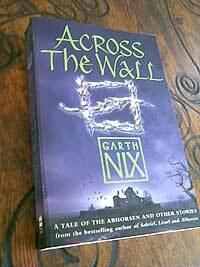 Garth Nix wrote an introduction to each story. What I thought: I was a bit disappointed with Across the Wall. It is an uneven collection- some great stories along with an odd assortment of stories that don’t really hang together. That said the good stories are strong enough to make the book worth reading. The main story, Nicholas Sayre and the Creature in the Case is the main feature of the collection. We meet Nicholas Sayre, the young man whose arrogance and and narrow minded logic nearly ended in disaster in Abhorsen. He has learnt his lesson in humility and wants to repair the damage he did. But before he can decide how to go about this, he is confronted with a secret government organisation, a monster out of the Old Kingdom, and the mystery of his own enchanted blood. This is a great story; a mix of horror and comedy, with references to PG Wodehouse, if you can imagine that. Hope Chest also worked for me. A baby girl is found abandoned on a large wooden chest in a western frontier town. The baby is adopted, but nobody can open the chest – until her 16th birthday. This is a odd combination of fairy tale, western and horror with rather heavy handed Hitler parallels. Most dreadfully gory – but a compelling story. Another successful story is Charlie Rabbit. Two little boys are trapped under a bombed house during an air raid. The elder brother has to make sense of the frightening events and keep his much younger brother safe and calm – while feeling far from safe himself. It reminded me rather of Shade’s Children. Something that could really have been left out is the mildly amusing My New Really Epic Fantasy Series which makes fun of the cliché’s of Fantasy. It would work very well as a blog post, but here it feels like its just padding out the book. So a fun read, but a bit unsatsifying.